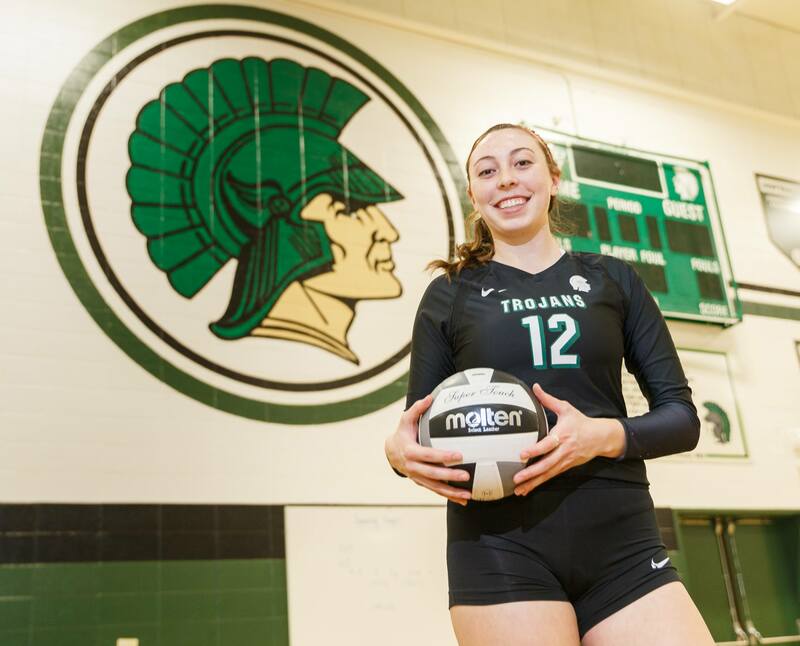 Wauwatosa West senior Clare Honan does it all for the Trojans girls volleyball team and she has been doing it since her freshman year. Clare's father, Dave, who played volleyball at Racine Horlick High School, initially got her to play for their church team when she was in fifth grade. 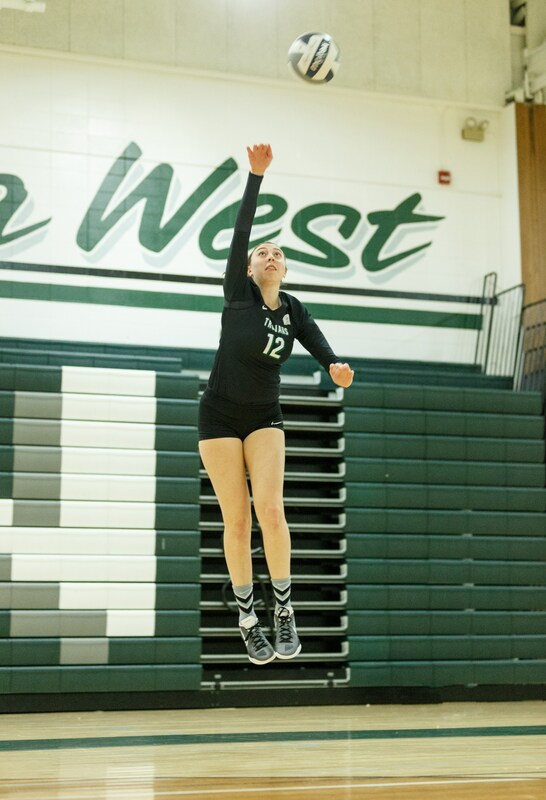 Honan, who played basketball at Whitman Middle School, and soccer her first two years at West, has focused on volleyball her past two seasons and is happy she did. Honan, who stands 6-feet, 1 inch and has accepted a scholarship at D1 College of Holy Cross, talked about what made her pick volleyball as her sport of choice. "I have always been tall," she said. "It was one of these sports where I could use being tall. I played soccer my whole life up until my sophomore year in high school. It (volleyball) was so different. I could hit things hard with my hands. "The team aspect is nice also. You're not going to succeed unless your whole team is involved. It's always been a lot of fun." Something caught West coach Kelly Dwyer's eye when initially reading Clare's sign up sheet at an Open House for all the incoming 8th graders. "The students would come in, get a tour," he said. "All the sports are lined up and we have sign-up sheets there. Name, number, email and if you played before. She wrote all that down and by 'if she played before' she put 'Sting,' which is a top club team. "That's when I first caught interest, because if you had someone who played there, you know they're going to be a good volleyball player. That's when I first learned about her." Clare, a 4-year varsity player for Dwyer, was second-team all-conference as a sophomore, first team all-conference and first team All-Woodland as a junior, while also earning honorable mention All-State honors. Dwyer also nominated her for the All-State honors once again this year. Honan will definitely leave her mark in the Trojan record books. She tops the school's all-time list in blocked shots, setting that career mark last year as a junior and is adding to it this year. She will finish second in history in kill shots behind Jenny Ciriacks, who was a Marquette University Club All-American. But the surprising stat, is she will probably finish in the school's Top 10 in digs, which is an unusual stat for someone who stands 6-feet, 1 inch. That is because - despite her length - she never leaves the floor because Dwyer doesn't have to sub in for her like he would a regular middle hitter. Because of her talents, she can just stay in the rotation all the way around. "That's unusual for a middle," Dwyer said. "Usually the team's libero replaces their middle because they (the middle) are the slowest and tallest and can't really move. I have no problem playing her back there. I don't think I've really seen another team do it the way we do. Clare's flexibilty helps Dwyer with his strategy. "Normally the libero is just a person who plays back row," he said. "They (libero) can sub in for two people. They can sub in for a few people and only play the back row for them. So when you middle goes to the back row, your libero comes in. "It helps because I can put my libero someplace else. I can put our libero on the outside right now. If we didn't have Clare I couldn't do that. But we have the flexibility to do that. It saves us with subbing." Dwyer has seen the improvement in Honan's play over time. "Her back row has gotten 10 times better," he said. "Her freshman year she made it a goal that she was going to play all away around (not come out of the game). We tried her out (back row) her sophomore year and she played it most of the time. Her junior year she stayed in no matter what." Clare remembers when she first asked Dwyer about wanting to try it. "My sophomore year I first brought it up to coach and he said 'I don't know about that.' My junior year he started playing me all around," she said. "I never want to be off the court." The experience also helped Honan watch the other positions and learn more about them. "It's really opened my eyes, seeing the court from all different perspectives like the liberos and the DS' (defensive specialists)," she said. "Always being in the right spot, knowing how to read. It's helped me with my block too, to know what the defense sees. I really enjoy it. I take a lot of pride in my game." In the beginning, Clare didn't do as good a job statistically as she needed it, so she worked on her game. "Coach changed his mind and let me do it," she said. "A lot of defensive players had graduated, so there was an opening. It was an adjustment. "The stats showed who was in the last row when team lost points. When I played the back row we were losing points. So I focused on it. My junior year that's what I tried to work on in practice - be as solid in the back row as I was in the front row. That was my goal." Honan and teammate Ericha Stuberg, a defensive specialist, constantly work together to get better. "We're always talking and figuring out where to go and which position works best for us depending on who we're going against," Clare said. "It's difficult, but once I could get in the right spot for digging it just makes everything better." Dwyer talked about Clare's strengths going into this season.
" Her hitting. She's a good attacker," he said. "Her court awareness. She's really smart on the court. It's like having another coach out there. There are times she's correcting somebody on the court before I can even get it out." Honan also talked the strong points of her game. "Definitely my ability to not get in my own head," she said. "Put a mistake behind me. If it's a loss, but we played well, I'm not going to get mad about that. I also think I have good control, hitting shots, tipping to where the defense isn't." So what does she need to work on. "I have so much," she said. "I'm definitely my worst critic. Having more communication - on the court, off the court, with coaches, with teammates. That can always get better. Blocking. I can always get better there." Honan then talked about the season - the Trojans were 20-10 and finished in third place - going into the post-season this week. "I am happy with my progress as a leader and helping out the people who are new," she said. "That's a really big change. Teaching - that's what I try to do. I never want to be overwhelming. Being back row, being able to see the floor, I can definitely help our other middle out on seeing spots to hit. I really like that." Clare, being a co-captain, credited Anna Baish, the other captain, for being the emotional vocal leader. "She's the fun one," Honan said. "She's always cracking jokes and she gets the team so invested, so involved in this. I try to lead by example. If we're down, I'm like 'The next one, we're going to get this.' I'm more results focused, to help my team along the way." Dwyer agrees with her assessment of her leadership skills. "I think she was a little shy at first," he said. "At the end of her sophomore year I started seeing her become a leader and wanting it more. I could tell she wanted to put in the work to get to where she is because she wanted it at that point. "That year we had a ton of seniors - that helped her a little bit - learning the leadership from them. At the end of her sophomore year you could see her start to kick it and you could see she was going to be something really good. She just needs to be more vocal. "I think she is starting to realize this year that these girls look up to her and they have more respect for her than I think she realizes. She's there to pick them up when they need it. It's more encouragement and the way she plays." Dwyer knows she is special as a person also. "She's kind. She looks out for them," he said. "She's like a coach out there; tells them what they need to hear. If they need to switch something really quick on the court she'll let them know. She is one of the nicest people I know." Dwyer also considers Honan one of the top three volleyball players he has coached along with Ciriacks and Elise Ditscheit. But despite all her accomplishments and honors, he knows who Clare really is. "She's the type of girl that wouldn't want any of this (recognition)," he said. "She prefers to go out and just do what she needs to do." FAVORITE FOOD: Potatoes of any kind. FAVORITE MOVIE: The Italian Job; Comedy and Action movies. FAVORITE TV SHOW: Parks & Recreation, Comedies. WHAT DO YOU DO TO RELAX? Hang around with friends. Watch Netflix. FAVORITE SPORTS RIVALRY/ATHLETE: Wauwatosa East. WHAT WOULD YOU LIKE TO DO IN THE FUTURE? Major in Political Science. Attend College of Holy Cross on D1 volleyball scholarship.